The Lerner College’s unique programs emphasize experience-driven learning and evidence-based analytics. We offer a state-of-the-art financial trading facility, the $1.2 million student-led Blue Hen Investment Fund, a student-managed restaurant and hotel, a high-technology development center of a global bank and a large student subject pool for decision-making experiments. Our use of hands-on learning and group project work is well regarded by employers of our graduates. Data-driven management and analytic methodologies are a distinctive feature of all Lerner College activities, teaching and corporate outreach. Applicants to the Delaware State MBA program must submit the following documentation to the Admissions Committee: a completed application; official transcripts for all previous undergraduate and graduate work; an official score report for the GMAT; two letters of recommendation from individuals capable of assessing the candidate’s ability to succee...Applicants to the Delaware State MBA program must submit the following documentation to the Admissions Committee: a completed application; official transcripts for all previous undergraduate and graduate work; an official score report for the GMAT; two letters of recommendation from individuals capable of assessing the candidate’s ability to succeed in a graduate business program; a resume; and, a personal statement of career objectives and personal philosophy. In order to earn unconditional admission, applicants must have completed all foundations courses at the undergraduate level, and they must show an undergraduate GPA of at least 2.75, a minimum GMAT score of 400, and earn a score of at least 975 under the formula [(undergraduate GPA ? 200) + GMAT score]. Applicants failing to meet these requirements may be admitted conditionally if they have an undergraduate GPA of at least 2.5 and a minimum GMAT score of 400; or, have an undergraduate GPA of at least 3.0 or an upper-division GPA of at least 3.25; or, meet all requirements except for the foundations requirement. Students admitted conditionally will have their status changed to ‘unconditional admission’ once they have completed three MBA-level courses with a grade of at least B; they must submit a satisfactory GMAT score before being allowed to register for a fourth MBA-level course. Applicants with significant work experience (at least five years) in management may apply for admission as non-traditional students; the school may waive GPA and GMAT requirements for such applicants. Students in the DSU MBA program form “a very culturally and ethnically diverse” group. Most are “hard-working students with full time jobs” and “many have families to support,” but there are also “some fresh college grads” in the mix. These “dedicated and helpful” students contribute to an intellectually challenging atmosphere.” DSU is located in Dover, the state capital. The state government and the United States Air Force are among the area’s top employers; others include Playtex, Procter & Gamble, and General Mills, all of which have manufacturing facilities in or around Dover. The city is conveniently located, with fairly easy access to Philadelphia, Washington DC, and Baltimore. According to the school’s website, the DSU Career Services office provides “technological and practical resources to provide students with the talent to conduct job searches, to become proficient in effective interviewing and presentation, and understanding the fit between their competencies and occupational requirements. Students also gain marketable experience through on- and off-campus collegiate activities, campus and community service, research projects, cooperative education, and internships to prepare them to manage their careers pre- and post-graduation.” The service is designed primarily for the benefit of undergraduates, although graduate students and recent alumni may also utilize it. Most of the students enrolled in the MBA program at Delaware State University’s College of Business choose the program for its “convenient location” and for its attention to the needs of the “working professionals and aspiring managers” who attend here (classes are held exclusively during evening hours and weekends). The school describes its MBA as “an accelerated program geared towards working adults” that can be completed in 18 months by those taking two courses per eight-week term and in just 12 months by those taking three courses per term. Even those shouldering a lighter workload can complete the program in two years by attending at least one summer session. The DSU MBA program is designed to promote integrative learning in a functional context so that students can build important managerial and organizational skills. The program requires students to complete 21 credit hours of core courses, one capstone course, and nine credit hours of electives, which can be used to pursue a concentration in a single subject. Students lacking corresponding undergraduate coursework may be required to take some or all of 18 credit hours in foundation courses. Foundation courses cover the following subjects: accounting, economics, finance, management information systems, marketing, and quantitative methods. Students may attempt to place out of any of these courses by passing a comprehensive exam, developed by the College of Business faculty, in the subject. DSU’s required core courses cover advanced economics, marketing management, business law and ethics, financial management, organizational leadership and behavior, operations analysis and management, and information and technology management. The capstone course is entitled Applied Strategic Management. Electives are offered in finance, information systems, and general management; concentrations are available in finance and information systems. Students may also participate in a case project in order to fulfill one of their elective requirements. According to the school’s website, the case project “tests the student’s strategic thinking and analytic skills” by requiring students either to (1) assess a company’s income statement, balance sheet, annual reports, and other such documentation and provide recommendations; (2) manage an investment portfolio; or, (3) analyze “a series of general management cases that cover a broad range of strategic issues facing companies.” In order to graduate, students must earn a minimum grade point average of 3.0 with no more than six credit hours with a grade of C. Students who receive a grade of D or F during a course will be dismissed from the program; the school has procedures in place for students to appeal dismissal and/or academic probation. Students are required to complete the program in no more than five years. 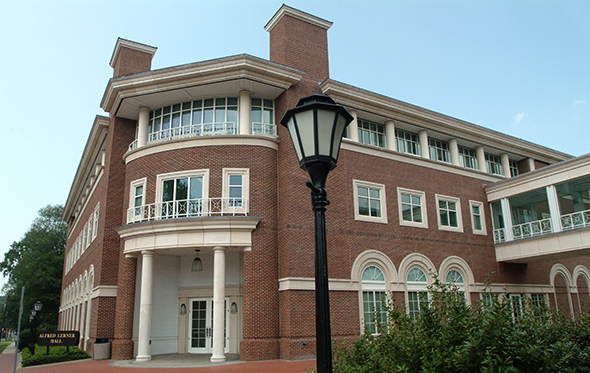 Want more info about University of Delaware, Lerner College of Business & Economics MBA, full and part-time? Get free advice from education experts and Noodle community members.